Human resource management, customer relationship management, keeping all your finances in check – these three sections are some of the most important aspects for your business when you want to scale at a bigger level. Sophisticated ERP solutions are a great way to manage everything for this. But the sad truth is not all ERP solutions are made in the same lab. They compliment each other rather than giving a complete solution. So when we found out about WP ERP, an ERP solution based on our favorite WordPress platform we couldn’t resist not getting our hands on it. WP ERP gives you the opportunity to manage different business operations from finances and employees to customers and sales from a single platform so staying ahead is instant and easy. This WordPress ERP implementation really caught us off guard. So we wanted to share our initial impression and thoughts with you. This is quite a detailed WP ERP Review, therefore we divided it into different sections. Click on the below list to navigate to the desired section. WP ERP is the first ERP solution that dedicatedly works with WordPress. ERP for a WordPress site was really something that not many people heard of before this. In that sense, it’s the oldest WordPress ERP and also remains the most comprehensive one. 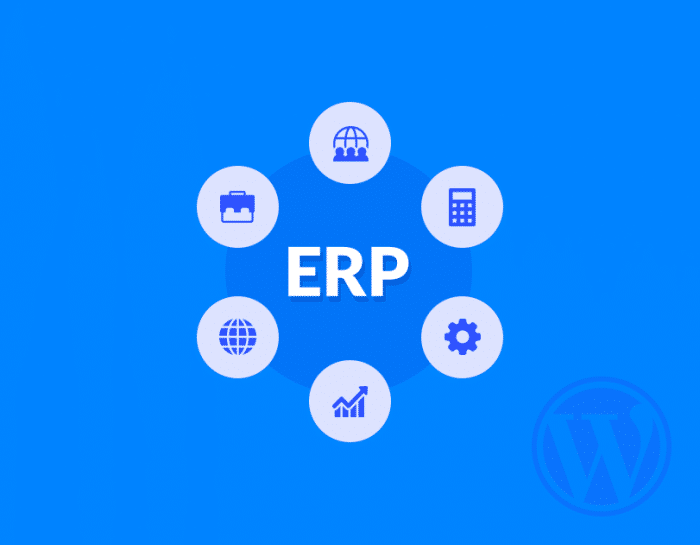 According to their website, WP ERP is mainly for small to medium businesses to make their everyday organizational lives better. That holds to be true. Their WordPress ERP solution provides a Customer Relationship Manager, a Human Resource Manager, and an Accounting module completely for free. Just head over to WordPress plugins store and download the free plugin. And you will get all these three modules for free. Also, the plugin has an onboarding process that lets you configure core settings very easily. Another cool thing is that you can even disable certain modules to make it work just like you want. So, let’s find out how the HR, CRM and Accounting modules of WP ERP works and can they really help businesses to automate their processes. Own company profile: This feature paves the way to add details of your company information such as the name of your company, street address, phone, type of your business that you do and much more. Branch Management: Your office may have different locations for its branches. With this feature, you can enlist them as per the location name, zip code, province, county etc. WordPress admin dashboard customizing features: You need to install different plugins in order to maintain your site. This often creates a number of redundant menu items within the dashboard. To hide the superfluous menu items WP ERP does a great job. Audit log to check overall workflow: Never get anything missing from the history. Using the audit log you can find the details like which employee has been created, who took leave, whether an announcement is made and so many more. 44 Currency Support: From the ERP settings menu you can configure different currencies for your business. The default currency is set to US dollar though. Notification emails with custom templates and shortcode support: The plugin comes with prebuilt email templates and the best part is it supports SMTP, IMAP/POP3 protocols to send and receive emails automatically. Set different user roles: From the WordPress Admin Dashboard if you select ‘Users’ menu item then you will find all users of your site whom you give customized access to HRM, CRM and Accounting modules separately. In addition to default WP User roles, you will get WP User roles, for example, Employee, HR Manager, CRM Manager, CRM Agent, Accounting Manager. Free form builder integration: This ERP tool even integrates with popular form builders like Contact Form 7, weForms, Ninja Forms, Gravity Forms etc. When dealing with the human resource management, WP ERP provides a very unique approach. It stores every single detail of your human resources inside your WordPress website. So that you don’t have to rely on any third party cloud solution to manage all your data. 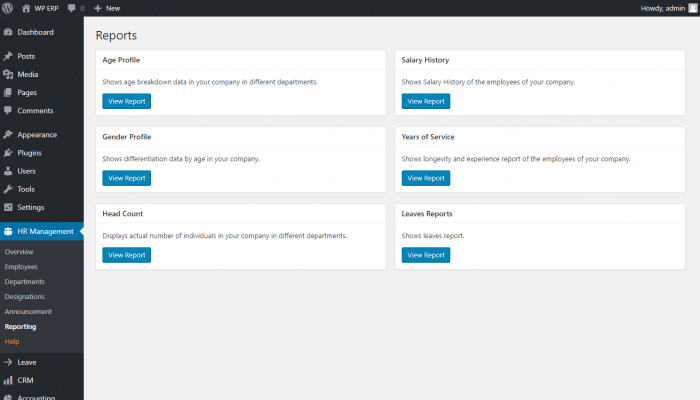 Individually speaking the HR module consists of an overview dashboard, employees section, departments, designations, announcements, and reporting. Though there are many more management options but they are available as premium extensions. 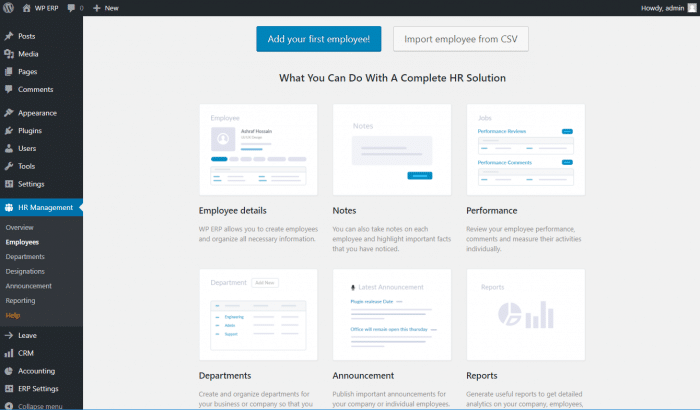 The overview section is the first thing you will see once you visit the HR module. It will give you a birds-eye view of everything that is essential in your human resource department. The number of your current employees, departments, designations, who is out on vacation and more. There is a handy announcement section too. It helps you to get your company announcements out to your employee’s fast maintaining privacy. It is published in the HR dashboard so you know they are bound to see it. There is also a monthly leave calendar that shows you detailed information for leaves of each employee. You can navigate to next month, previous month, choose to show the calendar as monthly, weekly or even daily. 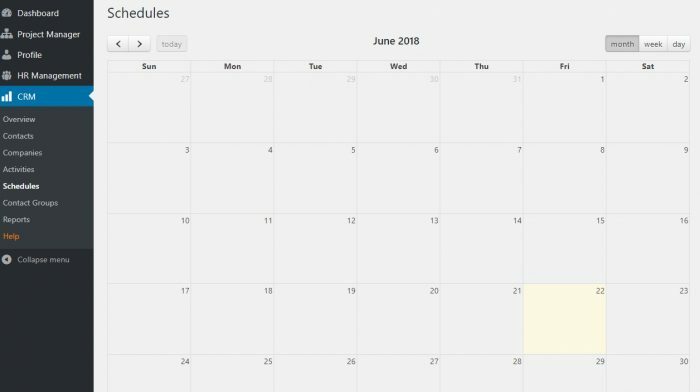 For your organizational employees, when they login, will also see the leave calendar, who’s out list, any announcement that authorities have made etc. They will also be able to see their detailed profile from my profile section. The employee’s section will help you keep tabs on all the employees currently working in your organization. When you are first starting out you even have the option to import from a CSV format file so that you don’t have to start from scratch when you are switching. After adding all your company employees to the list you will be able to see all the necessary information in a list. Including name, designation, department, employment type, the date they joined and other significant information. You can filter by designation, department or other attributes if you are in hurry. Each employee will have an individual profile consisting of all their information. We really appreciated the built-in performance evaluation feature for the company management. It really makes everything that much easier. Besides that, each of your employees gets their own individual profiles. From there, they can see their general information, job status, leave status, notes section that the HR managers can use, performance and much much more. In the department section, we were shown the total number of sections that are working in our company. You will also be able to see all your individual employees who are working in their respective departments. Here you will see the all the designations of your company with the number of people working. Same employee profile is also available in here too. All the designation features are completely customizable. When we first saw this feature we were really surprised to find something so useful that we would have later needed. 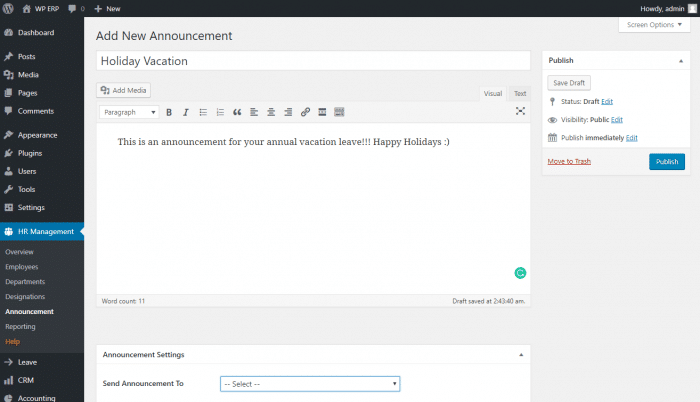 The announcement feature helps you to get your words out to your employees in an instant. Making an announcement was really easy too. We could select the title, the message, to whom the announcements will be sent to. We could choose from department, designation, all employees or selected employees. Time is everything for an organization. The more time it saves the better it is. WP ERP doesn’t fall short in that feature. 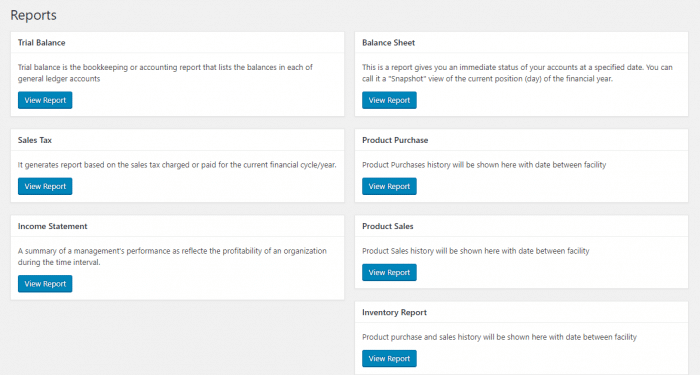 There is a reporting section to auto-generate every type of human resource report needed. We could generate a report by Age profile, Salary history, Gender profile, Years of service, headcount, leaves report. There are even customization how you want your report to be when you click on them. Choose the time duration, select the designation and so on. If you choose to extend the already capable HR module they even offer multiple extension to make everything much better. Recruitment extension: Turns your WordPress site into a recruitment site. So that you won’t have to rely on some other job recruitment platform for your company. HR Frontentend extension: Brings everything of your HR module to the frontend. Making it easily accessible for everyone with a simple login. 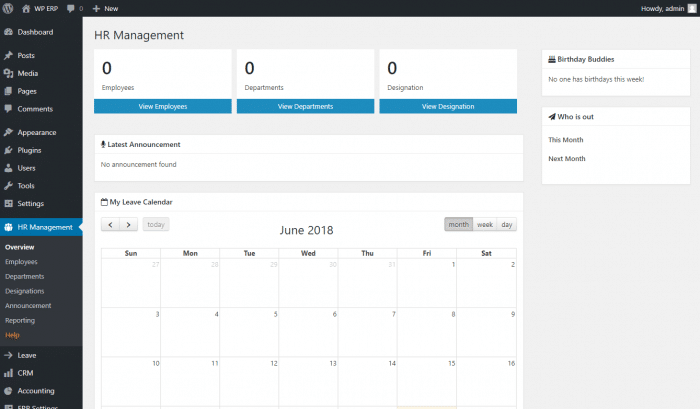 Attendance extension, for simple employee attendance system(we really like the IP restriction feature), Workflow(to automate certain tasks based on conditions), Document manager(allows for easy document management right in your WordPress site). Check out the full list from here. Customers are the most essential part of any business. And dealing with those customers effectively requires a tool that has the ability and options to manage it all from one place in a synchronized manner. The CRM module of WP ERP actively manages your company’s customer management system with interconnected components and essentials. An Overview section that gives the user the overall preview of daily and upcoming schedule for the month, day, and week. As well as the total number of customers, leads, opportunities, and subscribers. everything that is taking place in the Customer Management System. At the bottom right corner, a small widget box shows the number of inbound emails in your database. Add, manage or update the individual contacts of a customer or companies. Easily edit any contacts or update their life stages at any time. It allows you to search the contacts through various segment filtration that makes it easier for the user to find any contacts faster. For each contact of customer or company, you can save notes, send emails, add a log, create schedule & task and upload documents separately. This helps you target your desired customer or company in a more organized manner. Also filter search any particular previous activities by email, task schedule or note inputting the date of that specific period. You can also add a tag, assign a company or contact and view them as a contact group in the view section. Search your customer contacts or companies with the advanced search & filtering option of the CRM module. 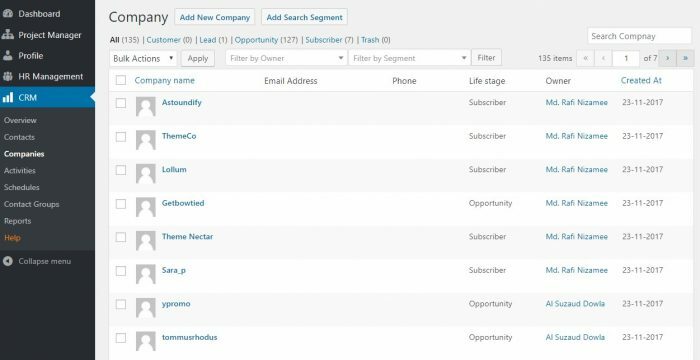 Filter search the stored contacts by owner, segment, and company to find them quicker. If you want you can also search the contact or company directly using the search bar at the top right corner of the page. Not just the contact, it is really easy to find the contact group as well with its quick search engine option. Making sure all the activities & scheduling of your task is a major concern of most customer management system. But with the highly developed activity & schedule managing facility of the CRM module, taking care of such issues is never a worry anymore. Quickly look for the activities that you have set for all the contact or company previously. Search them via a type of activities, email or with the company or contact it was created. All your scheduled activities can be viewed in the schedule tab as monthly, weekly or daily so that it becomes easier for you to prepare yourself for the upcoming activities. 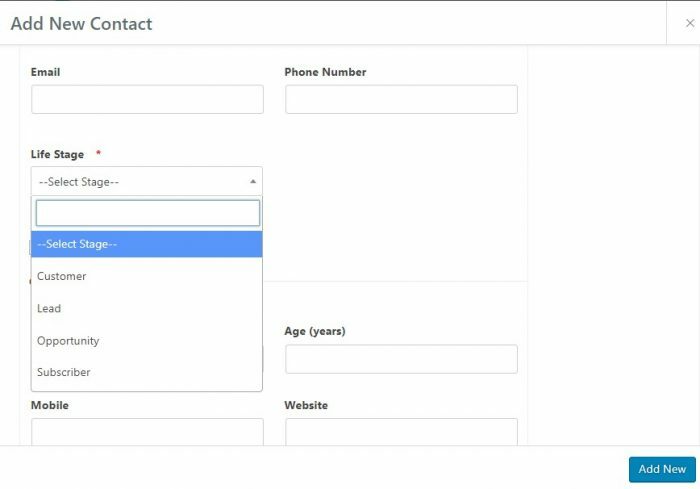 Assign your subscribers to your desired contact groups for easy segmentation. This enables the user to know the types of subscribers of all different interest. This assignments of contact groups helps the company to realize how to approach to different subscriber groups. Setting up a life stage to your contact lets you know whether the contact that you have approached is a Customer, Subscriber, Lead or an opportunity. This helps the company to quickly set up a strategy to target them based on their life stages. Reports play a vital role in helping a company understand the places where it needs to look into & improve. 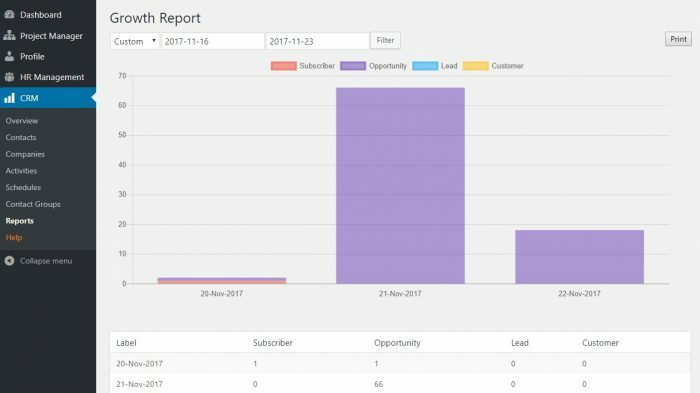 So the CRM module provides you with some useful reporting to make the most from your customer interest. The module lets you generate the activity report to give you an idea about all the actions that are being taken in it. It also gets you to have the customer report to help you know the types of customer that are currently involved. Lastly, create the growth report to find out the progress and development of your company over the years. The CRM extensions and integrations extend the functionality and usability of the core plugin to allow better contact and company management. These add-ons cover a wide range of connections like email, help desk, sales, workflow, and contact lists sync. 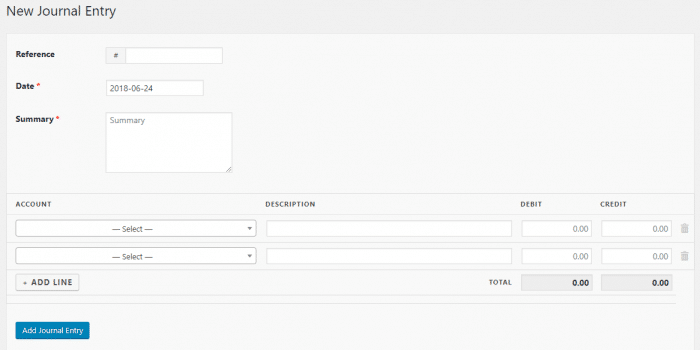 WooCommerce Integration: Easily track your WooCommerce sales by syncing the order details and customer data. Add the existing customers of your WooCommerce store into the CRM contact list by integrating it with WP ERP. 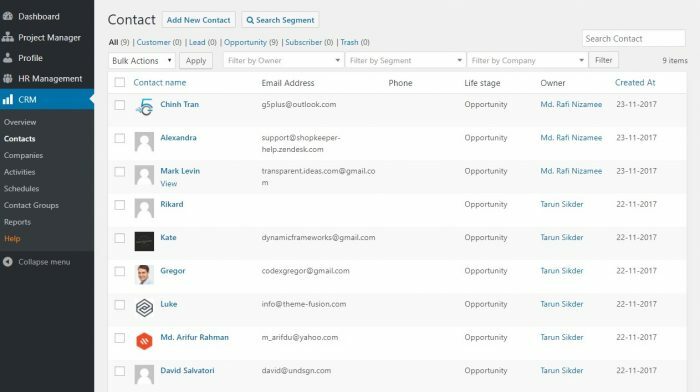 Deal: This tool helps organize the sales process by managing the contacts into a pipeline. Seamlessly integrate this extension with WP ERP to coordinate between multiple customers and hundreds of deals. WorkFlow: Boost up your workability by triggering actions according to your requirements. Easily create an automated action based on different types of events within your WP ERP system. Every business’s success pivots on making the right and opportune economic decision. Based on accounting insights, you can easily forecast the future that your enterprise is going to encounter so as to take any important business decision. The WP ERP Accounting module makes lets you accomplish this. The software can be accessed from any device that can render HTML5 web pages. Being able to keep track of every bit of your financial events from a single page is always time saving and effective. 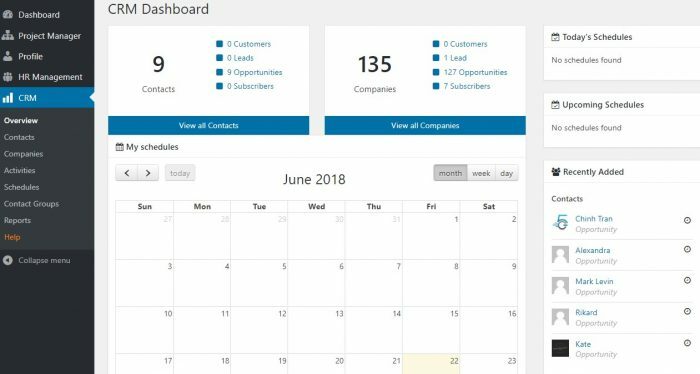 The accounting dashboard of WP ERP looks really impressive considering the intuitive interface that consists not just with numerical data but with graphical representation. As you can see in the above screenshot, with the help of Bar Diagram, you will get a quick view of how much you have spent or earned on a monthly basis. The pie chart indicates all kinds of business expenses including operating expenses. You can also get to know how much money is left on your petty cash account or in your bank account, how much is your revenue, bills receivable and payable. From on cash sales or expense to an on credit sales or expense transactions, the WP ERP accounting module can cover any type of sales transactions with its extensive capabilities. Especially, the payment in installment feature has really caught our attention. You will be able to know if there is an awaiting payment, partial payment or any closed payment very easily. What’s more! You can also void, print or export an invoice as a PDF. 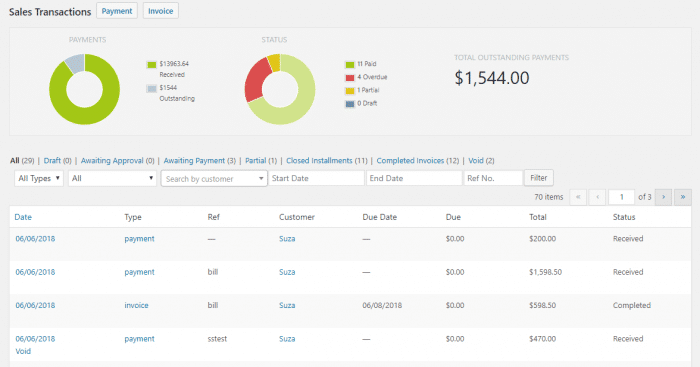 LIke sales transactions, the WP ERP accounting module will also allow you to record Expense transactions ranging from purchasing inventories on cash or on credit or in installments. It’s also possible to record any operating sales or expenses transactions through its journal entry functionality. 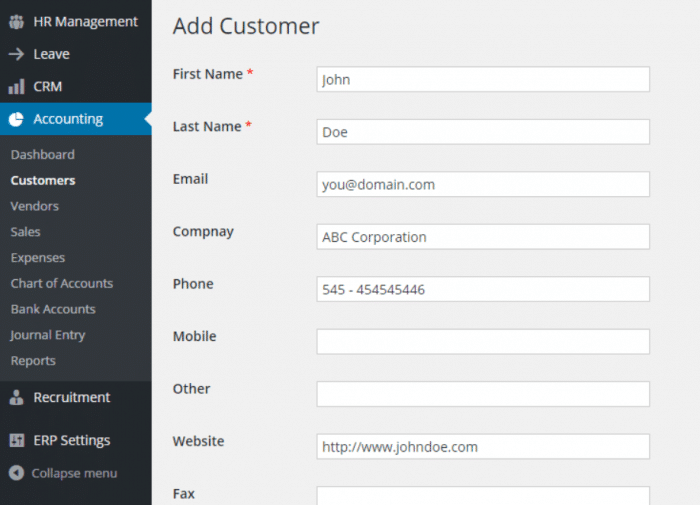 The easy to use interface lets you create unlimited customers and vendors using a modal form. After creating multiple vendors, you will be able to see a list view of the vendors. Besides, if you click on a vendor you will also get to know his/her status, for example, your vendor’s balance. Out of the box, the ERP system already has a bunch of accounts needed for the accounting purpose. But you can also add extra accounts from the chart of accounts. Reporting is the inevitable and integral part of the accounting process. The accounting module of WP ERP offers Trial Balance, Balance Sheet, Sales Tax, Inventory report, Income Statement etc. The scalability of this accounting tool is excellent. With paid extensions, you can manage your inventories, set payment gateways for online payments, reimburse your employees and you can even integrate WooCommerce with the system. The best part is that it has a very rich payroll feature although the feature can be availed using a paid extension called Payroll. 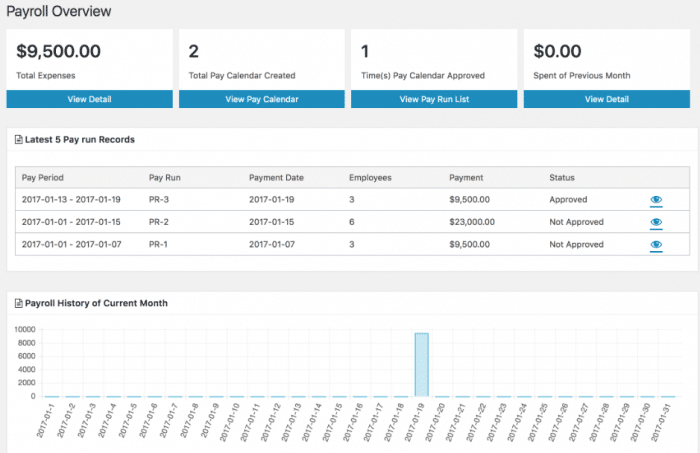 There is even a payroll dashboard with which you can get to know the payroll history, pay run records, pay calendars, total expenses and many more. For a free plugin, WP ERP is sufficiently feature-rich and easy for the average user. More importantly, it gets the job done. The plugin lets you execute the most essential tasks for company resource planning & management seamlessly. Apart from the fact that it’s the original WordPress ERP, it leads your way to a more cost-effective & professional seeming workplace and that too while making it all an easy process. We anticipate if it brings a pro version it would include some advanced features like cash flow statement and perhaps a more smoother mobile experience. We believe WP ERP consists of those features to let you hit the benchmark and take your business to the next level. It’s not enough to read just text. So we encourage you to check out the official demo of WP ERP to get a taste of how its core features and premium extensions work, and what it can add to your business. We hope you get a good value and experience out of this solution. Do you have a version of WPERP in Spanish?